Superior Interlock Corporation - Air Pollution Control Equipment - Electro-Static Precipitators (E.S.P. ), Baghouses, Scrubbers, etc. Superior Interlock has been working with original equipment manufacturers (O.E.M. ), rebuilders, and end users for over 50 years in the safe-guarding of personnel and equipment throughout the world. Drawing from this experience, the following information is a general guideline in the proper interlock sequence for E.S.P.'s. For your specific needs, please feel free to contact our engineers for a free proposal without obligation. Please see our precipitator cost estimator to help provide all required information for an accurate proposal. Superior Interlock can recondition, update, add, or replace your system. We understand the costs associated with outages and with our flexibility we will strive to meet your schedule requirements. Over the years we have found that the harsh environments of air pollution control equipment, petrol-chemical equipment, food processing, and many other caustic industrial climates require more resistant interlocks. We have developed the majority of our product line in stainless steel for this reason. We have formed a relationship with the Abloy Corporation to use their keys and locks in our products in areas where problems with common pin-tumbler locks arise. The Abloy keys are of an I-beam profile, providing great strength and break resistance. 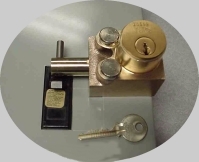 The Abloy locks are a non pin-tumbler type which is positively actuated by the key. This positive actuation requires no springs that may stick in industrial climates such as the ones found in precipitators. These locks are available in our standard product line as an option, and are standard in our stainless steel product line. 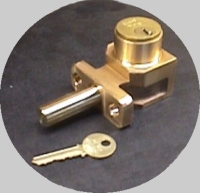 Systems may be mixed and matched with our standard pin-tumbler locks and Abloy locks in standard or stainless steel housings to suit any application. Precipitators are being used in more and more industries due to environmental concerns and government regulations. A precipitator is used to remove particulate (dust and soot) and prevent it from entering the atmosphere. The particulate is removed by passing a gas containing the particulate past a series of high voltage plates. The particulate is attracted to these plates by the high voltage static charge. Rappers are used to knock the dust off the plates into the hoppers below for collection and disposal. The high voltage static charge is produced by a transformer rectifier (T.R.). This takes A.C. power from the facility, boosts the voltage and rectifies it to produce D.C. This is used to charge the plates. The plates' potential can be in excess of 50,000 volts. For this reason, access must be restricted until safe. The power must be locked off and the plates grounded to remove residual charges. The first part of the process in interlocking the precipitator is to lock off the power in the control cabinet that feeds the T.R. This can be done by locking of the switch or circuit breaker supplying power to the control cabinet or using a panel mount key switch that may be used to control the internal electronics of the cabinet. Once the cabinet has been safely locked off and keys obtained, giving evidence that the cabinet has been locked off, they are then taken to the T.R. The T. R. is a non-load break capable switch. For this reason, it can only be operated when the control power is shut off. The key from the control cabinet is inserted into the lock that locks the T.R. in the high voltage or operate position. When the key is inserted and the lock unlocked, the T.R. switch may now be put into the off and ground position. When in the ground position, a second lock will lock it grounded, releasing another key. When the plates are all grounded, it is safe to access the precipitator. When all control cabinets are locked off and all the T.R. 's are locked in the ground position, all of the ground position keys are released. All these keys are then taken to the transfer interlock and inserted. When all of the ground keys are inserted, this will release all of the access interlock keys. These keys may be taken to all of the entry point interlocks, and the precipitator may now be opened up for maintenance and repair. 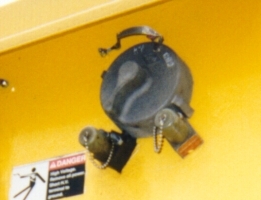 If nuclear level detectors are used within the hoppers, or any equipment, they must also be incorporated into the interlock system. This prevents operators from being exposed to radiation. It is recommended that all level detectors are locked in a shielded, safe position. When the keys are released they are taken to the transfer interlock and inserted, along with the ground keys, prior to releasing any access interlock keys. Specific facility grounding procedures may also be incorporated into the interlock sequence. Superior Interlock's access interlocks have a key retaining feature that prevents an access key from being removed from an interlock when the access way is open. For this reason, to reverse the above procedure to restore the equipment to its original operating position, all access ways will be safely locked closed. Some T.R. 's have multiple positions for greater flexibility for a facility. For this reason, more complex interlock schemes will be provided to maintain the greatest of flexibility for this equipment. Superior Interlock's engineers will work with their counterparts to provide a safe and flexible custom designed system. Sample electro-static precipitator key flow diagram.